Hurrying toward the Ivan Albright show at the Art Institute of Chicago a few weeks ago, I passed a quartet of paintings by Georgia O'Keeffe and had to pause and smile. I first saw those paintings, not in a museum, but in an apartment, above a pair of white sofas in Gabriella Rosenbaum's Michigan Avenue high rise. Rosenbaum had promised to donate them to the Art Institute, and I was sent to find out who she was and why she was giving the paintings. The photographer Robert A. Davis went with me, and we had one of those moments that lives forever in mind. We were setting up her portrait, and there was the challenge that she was in a wheelchair, while the paintings were high on the wall. So rather than raise her up, Bob simply brought a painting down, abruptly seizing it with both hands, lifting it off its hook, and setting it down on the floor next to her. The room sort of froze at that moment. "The sound you hear," I said, "is every lawyer at the Sun-Times going like this." And I cocked my head to the side, as if listening for a sound far away. She died five years after this column ran, in 2000. 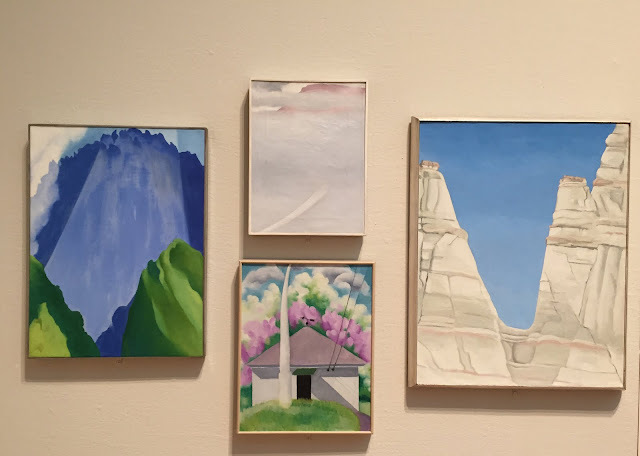 Her name is very small on plaques by the paintings—plus another, enormous canvas of clouds in a stairway, she had already given—and I thought I'd share a bit of her story today, since it ends with her birthday party, and my birthday is today. There is no better way to celebrate your own birth than to focus on somebody else. The Nazis didn't get her. The temptations and traps of wealth failed to snare her. Age, which claimed so many of her friends, has been kind to her. And now, at 90, Gabriella Rosenbaum seems poised to cheat Time itself, creating a legacy which still will be benefitting her beloved Chicago long after she has gone to her well-earned rest. A woman who shuns the public eye, she nevertheless has affected some of its most revered institutions. The giant Georgia O'Keeffe masterpiece "Sky Above Clouds IV" at The Art Institute of Chicago was donated by Rosenbaum, as was the ARTiFACT wing of the Spertus Museum. Programs at Hull House and elsewhere are funded by her two foundations, which have pumped $ 10 million over the past decade into local philanthropy. She paid for the splendid garden in the park just north of the Drake Hotel. A visitor to Rosenbaum's Gold Coast home may at first be dazzled by the artwork on the walls -- who could not be impressed by five fantastic O'Keeffes in her living room? Or a lovely Klee? Or an Egon Schiller? Or a Calder? But sit down and talk to her, and listen to her relate her extraordinary life in her hushed, soft accent, and if the vibrant colors of the O'Keeffes do not precisely dim, they certainly are challenged by another, altogether different radiance. Gabriella Kramer was born in 1905 in the town of Nitra, in what was then Hungary, in a home that was brimming with artistic endeavor. "We were three sisters," she begins. "My oldest sister graduated from the Budapest Music Academy. She was a very accomplished pianist -- and when there was any artist performing in Nitra, she was the accompanist, and they would visit our house." Even then, her family was good at business. They were manufacturing asbestos roofing at a time when most houses were roofed in thatch. They made the first artificial ice machine in the region. At 16, she went to study art in Vienna: "the town of song and wine." "I had no head for studies," she says, "but I had an artistic leaning." From art she became involved in eurythmics, a discipline combining movement and music. She danced. She choreographed dance. "That was a revelation," Rosenbaum says. "Because for the first time I, a very introverted person, could express myself without being criticized." Her new confidence helped her meet her husband, Paul Rosenbaum, on a streetcar in 1933. They began to form their life together at the very moment the greater world of European Jewry was about to come apart. The deteriorating situation began to affect their lives. Gabriella Rosenbaum, now teaching movement and gymnastics at a school she owned, lost the chance of working at the eurythmics headquarters in Munich because she was Jewish. Her husband traveled to America to join his brother Max, who had a successful business operating penny-candy-scale concessions in movie theaters. She credits their partnership as helping them see what was in store for Europe. "It was my husband and me. That was our marriage -- it was a partnership," she says. "I was a prodigious reader and I knew what was happening. I knew what Hitler meant. So many Jews hoped that they could just somehow get along." Her escape to join her husband in America was dramatic, almost cinematic. When the Germans partitioned Czechoslovakia, the visas were at the U.S. Embassy in Prague, and she was across the border in Nitra. Gabriella tried to cross with her two daughters, dressed as peasants, but she couldn't convince the guards that she was on her way to sell a goat and was turned away. They ended up on a sealed train, traveling through Germany, two days before the war broke out. They crossed the border into France on Aug. 29, 1939, the day before the Germany-France border was closed to Jews. The trip is still very much with Gabriella Rosenbaum. "The children felt the tension as we went by train through Germany," she says. "Everybody was silent. You know how people talk on trains? Everybody was just plain silent. The children sat and were good." After waiting in France several weeks, they slipped across the Atlantic in the cargo hold of a banana boat. The crossing took 10 days. The family moved to Chicago's South Side in 1941. Her husband manufactured soda vending machines and developed the first fresh-brewed coffee machine. She settled into a life of raising her daughters. Her artistic skills were put to use designing posters for the PTA. But in 1964, she was in California when she read an article about an artist who intrigued her -- Georgia O'Keeffe. "I was looking for something for Paul's 70th birthday," she said. "At the time, Impressionists were in big vogue, and they were very expensive. When I saw her paintings, I said, 'Who is she? That is sensational. I don't have to pay ridiculous prices for Impressionists when we have a painter like her right here.' "
She journeyed to O'Keeffe's studio in New Mexico. She met the artist in her garden, and the two sat and listened to Beethoven together, then had lunch. "We clicked," says Rosenbaum. "I understood her and she understood me." Rosenbaum bought three pictures and, later, when she realized that nothing else could quite share wall space with them, two more. All will end up, eventually, in the Art Institute, where Rosenbaum is credited with, quite quietly, transforming its collection into one of the preeminent holdings of O'Keeffe in the world. "She is a woman who never emphasizes her own extraordinary breadth of taste," said James Wood, director of the Art Institute. "She was someone who understood the importance of O'Keeffe as an artist, as well as the necessity to keep these works in Chicago. She exemplifies the idea of civic support for the arts. She not only believes in art, but feels strongly about making a contribution back to the city." At her recent 90th birthday party, in a private room at the swank downtown restaurant Spiaggia, about 100 people gathered to wish Gabriella Rosenbaum well. Ald. Ed Burke read a proclamation from the City Council. Her devoted daughters, Edith and Madge, made a few remarks. Down below, the lights of the garden she donated, in her name and the name of her husband, who passed away in 1982, twinkled brightly in the crisp winter air. Thank you. And I hope you have a wonderful day with your family. Very nice. I'll keep an eye out for the O'Keeffe paintings on my next visit. Happy Birthday! I'll be celebrating on the shore of Lake Superior in the Porcupine Mountains. Good story. When someone is rich and has good taste, it's a great combination. She sounds like a remarkable woman. Beautiful story to brighten up a rainy Sunday morning. Happy Birthday, Neil. Thank You, Gabriella. and thanks for the picture of the sign. my neighbor hung himself Wednesday and I was informed of the suicide of a friend on Friday . I understand when celebrities take their own lives there is a spike in the general population. I imagine thats why you posted that . I remember your columns about the metro station suicides.